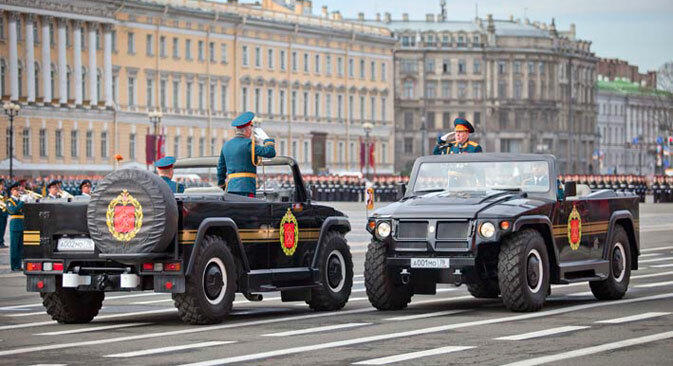 The Victory Day Parade in St. Petersburg's Palace Square (Dvortsovya Ploschad) was held on 9 May 2013 to commemorate the 68th anniversary of the capitulation of Nazi Germany in 1945. During World War II, St. Petersburg (then - Leningrad) was besieged by German forces. The Siege of Leningrad was one of the longest, most destructive, and most lethal sieges of a major city in modern history. On May 1, 1945 Joseph Stalin named Leningrad, alongside Stalingrad, Sevastopol, and Odessa, hero cities of the war. 22 other Russian cities also held parades on this day. The biggest one is traditionally held in Moscow. For the first time ever, cadets of Peter the Great Naval Corps (St. Petersburg Naval Institute) has marched on the Red Sqaure among 11, 000 other troops.